Fairfield is a suburb to the south west of Sydney, not far from Liverpool. Our grounds for games changes with the seasons based on availability. Springfield Park, Cnr The Promenade & Junctions Sts, Old Guildford. (Grey marker on map below). There is on street parking available. The Promenade runs off Woodville Rd to the east, Junction Street runs off Railway Street to the West. There are Toilets available at the grounds. Click Here for a more detailed map & directions to Springfield Park. Avery Park, on the corner of Thorney Rd & Cumberland Highway, Fairfield West. (Pink marker A on map below). The main car park is accessed via Cambridge St which runs off Hamilton Rd. There are Toilets available at the grounds. Click Here for a more detailed map and directions to Avery Park. Endeavour Sports Reserve, The Boulevarde, Fairfield West (Green marker on map below). The main car park is off Maud St which is best accessed from Thorney Rd off the Cumberland Highway. There are Toilets available at the Grounds. Click Here for a more detailed map and directions to Endeavour Sports Reserve. Dwyer Oval, Williamson Crescent, Warwick Farm. (Light Orange marker on map below). Best access off the Cumberland Highway is via Viscount Avenue, follow the road around past the oval then left into Lawrence Hargrave Rd, then left again into Williamson Crescent. Alternative access is available from the Hume Highway, north into Homepride Avenue, right into Lawrence Hargrave Rd then left into Williamson Crescent. There is a large off street parking area. There are toilets and other amenities available at the grounds. Click Here for a more detailed map and directions to Dwyer Oval. Tarlington Reserve, Newleaf Avenue, Bonnyrigg. (Aqua marker on map below). There is on street parking available. Newleaf Avenue runs off Edensor Rd to the north. There are NO amenities at the grounds, these are still to be built. Click Here for a more detailed map and directions to Tarlington Reserve. St Narsai Assyrian Christian College, 673-683 Smithfield Rd Edensor Park. (Mauve marker on map below). There is an off street car park available. Smithfield Rd runs off Elizabeth Drive to the South. There are toilets available at the grounds. Click Here for a more detailed map and directions to St Narsai College. Stockdale Crescent Reserve, on the corner of Stockdale Crescent and Cowpasture Rd, Abbotsbury. (Yellow marker on map below). There are Toilets available at the grounds. 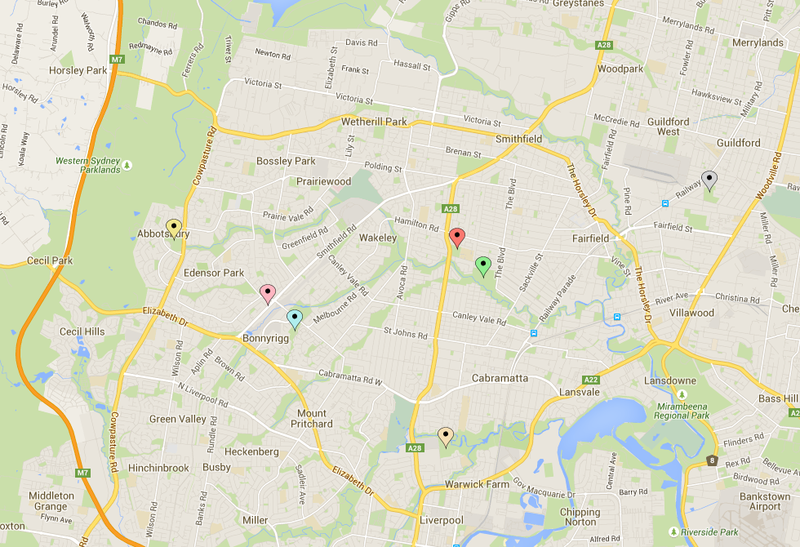 Click Here for a more detailed map and directions to Stockdale Crescent Reserve.